For other uses, see Appellation d'origine contrôlée (Switzerland). The appellation d'origine contrôlée (AOC; French pronunciation: ​[a.pɛ.la.sjɔ̃ dɔ.ʁi.ʒin kɔ̃.tʁo.le]; "protected designation of origin") is the French certification granted to certain French geographical indications for wines, cheeses, butters, and other agricultural products, all under the auspices of the government bureau Institut national des appellations d'origine, now called Institut national de l'origine et de la qualité (INAO). It is based on the concept of terroir. The origins of AOC date to the year 1411, when Roquefort was regulated by a parliamentary decree. The first French law on viticultural designations of origin dates to August 1, 1905, whereas the first modern law was set on May 6, 1919, when the Law for the Protection of the Place of Origin was passed, specifying the region and commune in which a given product must be manufactured, and has been revised on many occasions since then. On July 30, 1935, the Comité National des appellations d'origine (CNAO), with representatives of the government and the major winegrowers, was created to manage the administration of the process for wines at the initiative of deputy Joseph Capus. In the Rhône wine region Baron Pierre Le Roy Boiseaumarié, a trained lawyer and winegrower from Châteauneuf-du-Pape, successfully obtained legal recognition of the "Côtes du Rhône" appellation of origin in 1936. After World War II the committee became the public-private Institut National des Appellations d'Origine (INAO). The AOC seal was created and mandated by French laws in the 1950s, 1960s and 1970s. On July 2, 1990, the scope of work of the INAO was extended beyond wines to cover other agricultural products . AOCs vary dramatically in size. Some cover vast expanses with a variety of climatic and soil characteristics, while others are small and highly uniform. For example, the Côtes du Rhône AOC "covers some 400 square kilometres (150 sq mi), but within its area lies one of the smallest AOCs, Château-Grillet, which occupies less than 4 hectares (9.9 acres) of land." The INAO guarantees that all AOC products will hold to a rigorous set of clearly defined standards. The organization stresses that AOC products will be produced in a consistent and traditional manner with ingredients from specifically classified producers in designated geographical areas. The products must further be aged at least partially in the respective designated area. Under French law, it is illegal to manufacture and sell a product under one of the AOC-controlled geographical indications if it does not comply with the criteria of the AOC. AOC products can be identified by a seal, which is printed on the label in wines, and with cheeses, on the rind. To prevent any possible misrepresentation, no part of an AOC name may be used on a label of a product not qualifying for that AOC. This strict label policy can lead to confusion, especially in cases where towns share names with appellations. If the town of origin of a product contains a controlled appellation in its name, the producer (who is legally required to identify the place of origin on the product label but legally prohibited from using the full town's name unless the product is an approved AOC product) is enjoined from listing anything more than a cryptic postal code. For example, there are a dozen townships in l'Aude that have Cabardès in their names, several of which are not even within the geographical boundaries of the Cabardès AOC. Any vineyard that produces wine in one of those towns must not mention the name of the town of origin on the product labels. Legislation concerning the way vineyards are identified makes recognizing the various AOCs very challenging for wine drinkers not accustomed to the system. Often, distinguishing classifications requires knowledge of esoteric label laws such as "Unless the wine is from a Premier Cru vineyard, the vineyard name must be printed in characters no more than half the height of the ones used for the village name"
In 1925, Roquefort became the first cheese to be awarded an AOC label, and since then over 40 cheeses have been assigned AOC status. 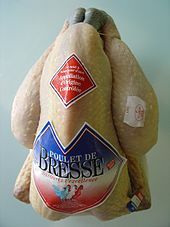 On August 15, 1957, the National Assembly gave AOC status to the poultry of Bresse (Poulet de Bresse). In 2006, it awarded AOC status to salt marsh lamb raised in the Bay of the Somme. In 1981, the AOC label was given to Haute-Provence Lavender Essential Oil. It refers to a very high-quality production and concerns only the essential oil of fine lavender - Lavandula angustifolia. The fields must be located within a specific territory at a minimum altitude of 800 meters. This geographic area covers 284 communities in the Alpes-de-Haute-Provence, Hautes-Alpes, Drôme and Vaucluse regions. Honey from the island of Corsica has been given AOC status. There are six certified varietals of Corsican honey: Printemps, Maquis de printemps, Miellats du maquis, Châtaigneraie, Maquis d'été, and Maquis d'automne. France recognizes the Charente, Charente-Maritime, Vienne, Deux-Sèvres and Vendée AOC regions for butter. The Beurre Charentes-Poitou has been assigned AOC status in 1979. Armagnac, Calvados, Cognac and Martinique Rhum Agricole all have AOC status. Many other countries have based their controlled place name systems on the French AOC classification. Italy's Denominazione di Origine Controllata and Denominazione di Origine Controllata e Garantita followed the model set by the French AOC, and the EU standard for Quality Wines Produced in Specified Regions (QWpsr) also corresponds closely. While Spain's Denominación de Origen is very similar, the classification of Rioja in 1925 and Sherry in 1933 preceded the French AOC system by a few years and show that Spain's DdO system developed parallel to France's AOC system to some extent. Similarly, Germany's Qualitätswein bestimmter Anbaugebiete is a wine classification system based on geographic region, but it differs from the AOC in important ways. Qualitätswein bestimmter Anbaugebiete wines are commonly seen as less prestigious than Qualitätswein mit Prädikat, making it more similar to the Vin de Pays or Vin Délimité de Qualité Supérieure systems. Portugal's Denominação de Origem Controlada, Austria's Districtus Austria Controllatus, South Africa's Wine of Origin, and Switzerland's AOC-IGP are all similar to the French AOC system as well. It appears also that AOC influenced the development of the European Union's protected designation of origin (PDO) system. Switzerland has an appellation d'origine contrôlée certification for wines and an appellation d'origine protégée certification for other food products. Before 2013, the appellation d'origine contrôlée was used for all products. The United States' American Viticultural Areas also follows the model set by the French AOC. The United States Department of the Treasury's Alcohol and Tobacco Tax and Trade Bureau even uses the legal terminology "Appellation of Wine Origin" to describe a vintage wine's location of origin. The AVA indication on a label indicates that 85% of the grapes for wine are grown in the designated AVA. Overall, the appellation of a wine simply says where the grapes are from, although there are some particularities. If the appellation is a state, 100% of the grapes which go into the wine must come from the specific state. If a winery gets grapes from a neighboring state (for example, a California vintner getting Pinot noir from Oregon), it may label the wine "Oregon", but if the state is not a neighboring one (for example, a California vintner getting Cabernet from Washington state), the only permitted appellation is "American." In Canada, there is a government-sanctioned wine standard called Vintners Quality Alliance (VQA). It only applies to Canadian wines, and only the provinces of Ontario and British Columbia regulate it. Outside their home country, protecting the AOC status of certain products can face challenges, notably from a legal perspective. 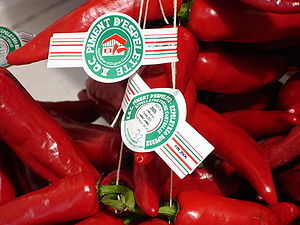 Some countries do not uphold a geographical indication system for their own products and thus, products which are labelled AOC in France, for instance, can be confronted on the international stage with foreign products claiming a similar geographical origin, even though it has not been recognized as such by the AOC system. In such a case, France (or another country) may enter into bilateral agreements with other countries, whereupon the signatories accept to recognize a special status to a list of designated products, or it can also seek the development of rules or agreements at the World Trade Organization level. Since each country has its own legal and agricultural framework, the specifics of each trade relationship are likely to vary. Also, there are often conflicts between trademarks and geographical indications. For instance, in Canada, only Canadian wines can be VQA approved but other certification trademarks can be registered under the intellectual property legal regime. The owner of a certification trademark is then allowed to sell licences to be used for certain products meeting the owner's criteria. Thus in the case of wines, one AOC certification trademark is owned by the French Republic, while another is owned by Maison des Futailles, a wine producer, of which the publicly owned Société des alcools du Québec is a partner. ^ Bouneau, Christine (1998). "CAPUS Joseph, Marie 1867-1947". Dictionnaire des parlementaires d'Aquitaine sous la Troisième République (in French). Presses Univ de Bordeaux. p. 182. ISBN 978-2-86781-231-6. Retrieved 2015-08-12. ^ Lukacs, Paul (2013-10-21). Inventing Wine: A New History of One of the World's Most Ancient Pleasures: A New History of One of the World's Most Ancient Pleasures. W. W. Norton. p. PT200. ISBN 978-0-393-23964-5. Retrieved 2015-08-12. ^ a b Joseph, Robert (2005). French Wine Revised and Updated. Dorling Kindersley. p. 37. ISBN 0-7566-1520-8. ^ Lascève, Agnès (19 June 2011). "La baie de Somme". France Today. FrancePress. Archived from the original on 14 August 2011. Retrieved 25 March 2012. 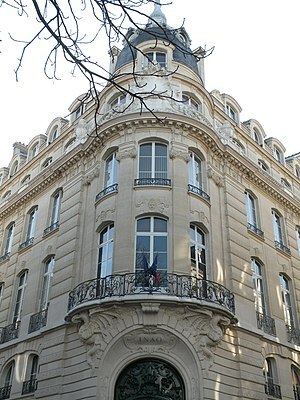 ^ "INAO - Institut national de l'origine et de la qualité". inao.gouv.fr. ^ "WINES: What's in a Name?". winetrail.com. Phillips, Roderick (2000). A Short History of Wine. New York: HarperCollins. ISBN 0-06-621282-0.